My grandfather’s postcard collection dates from 1906-1910, a wonderful glimpse into the life of small, turn-of-the-century boy. But Donald C. Minor’s cards also offer the simple pleasure of Christmas artwork, which I never tire of admiring. Two red-breasted songsters perch on a sprig of holly, which is decorated with a sprig of mistletoe and a golden horseshoe. This brightly colored card is meant to bring the recipient great cheer, that is for certain. Published by the New York-based Samuel Langdorf and Company*, number 841 was one of several designs the company printed in Saxony, Germany in 1910. 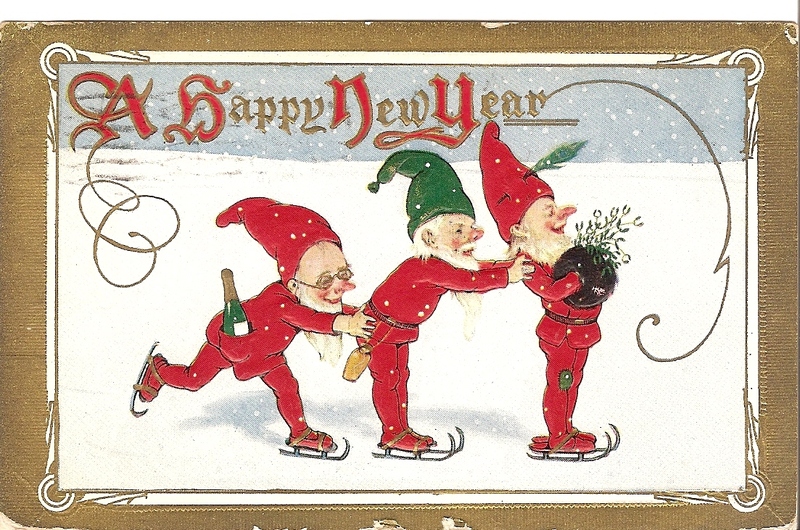 Donald C. Minor received this card from Ralph on December 20, 1910. There are other postcards from Ralph and his younger brother, Blair, in my grandfather’s postcard collection. Using the search engine of Ancestry.com I entered Ralph as living in South Connellsville, PA in 1910 with a sibling, Blair. The return included a interesting match: Ralph Younkin, 10, son of Milton R and May Waychoff Younkin, living with Blair, 8, and grandmother, Jennie Waychoff, in Connellsville, Fayette County, Pennsylvania. I have researched the Minor family fairly well, and the Younkin surname is unfamiliar. However, recently collected cousin memories suggest that Donald’s parents were friends with the Waychoff family; perhaps May Stephenson Minor and May Waychoff Younkin were exchanging Christmas cards, too! Interesting how a fascination with Christmas postcards intertwines with a family history. Merry Christmas, indeed! *The winged orb on the back of the card is identified by the Metropolitan Postcard Club of New York City as the trademark for Samuel Langford and Company, publishers from 1906-1918. Accessed on December 16, 2011. May your New Year be filled with elfish jollification! 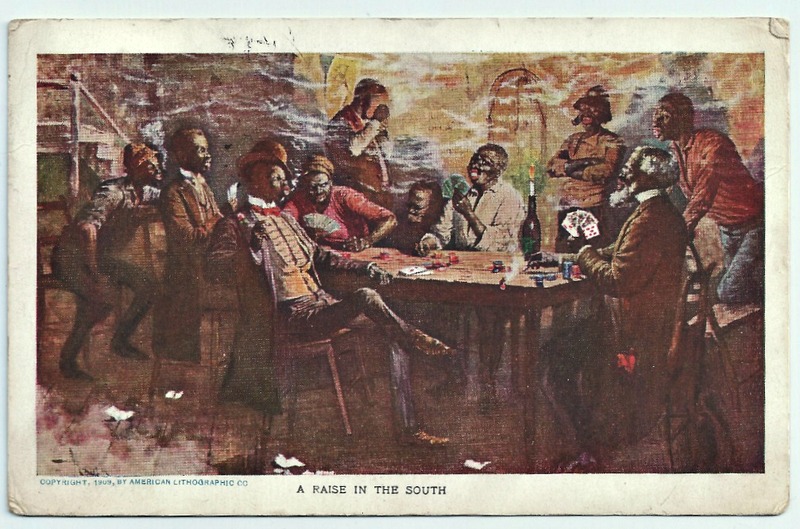 This postcard was found among my grandfather’s collection and is hand postmarked 1907. Five year old Donald C. Minor received this note from his teenage cousin, Flossie McClure. The J.I Austen Company of Chicago was but one entity capitalizing on the popularity of Bertha L. Corbett’s “Sunbonnet Babies”. An accomplished illustrator, Miss Corbett had first drawn the babies, faces hidden, to demonstrate to peers that plenty of expression could be conveyed by a figure alone. Leaving the Minneapolis School of Fine Arts, Bertha Corbett studied under the great illustrator, Howard Pyle, at the Drexel Academy in Philadelphia. 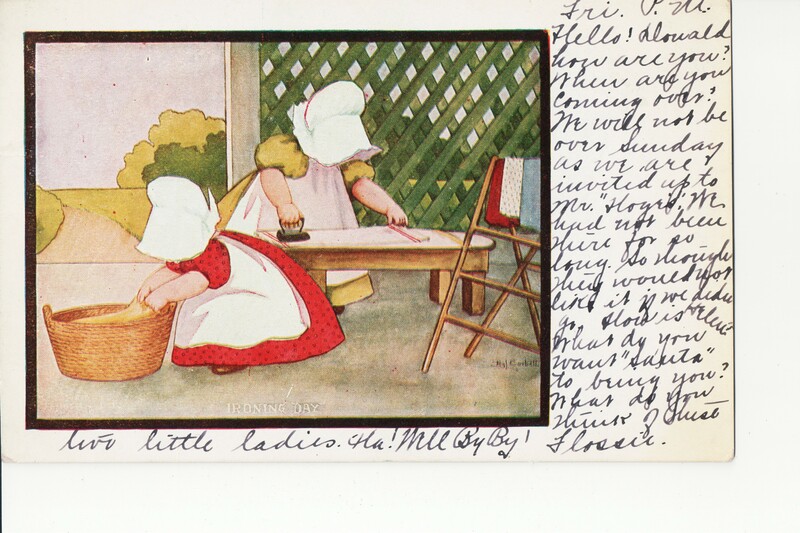 While perfecting her drawings of children, she was approached by Eulalie Oswood Grover to illustrate her popular primers for children, and in 1902 the Sunbonnet Babies Primer was published to great acclaim. Soon Bertha Corbett’s babies were being sought by commercial entities to sell all sorts of products. The images were also used on postcards and quilt patterns as well. This card is signed by the artist on the far right. 1. Radner, Joan Newlon. Feminist Messages: Coding in Women’s Folk Culture. Urbana: University of Illinois, 1993. 99-100. Google EBooks. Web. May 2, 2012. 2. Woman’s Who’s Who of America: A Biographical Dictionary of Contemporary Women, 1914-1915. Ed. John W. Leonard. New York: American Commonwealth, 1915. 554. Google EBooks. Web. 2 May 2012. 3. Buckley, James M., ed. “The Mother of the Sun-bonnet Babies.” The Christian Advocate 82 (1907): 1582-583. Google Ebooks. Web. 2 May 2012. If I Could Send You a Happy New Year Card, It Would Be. . .
One hundred and one years ago my grandfather, Donald C. Minor, gazed upon this Black-Capped Chickadee. The four-leaf clovers may have sent him scampering to the window, frustrated by the snow or hard frost that separated him from his own patch of good luck. January 1, 1911 in southwestern Pennsylvania would have been gray, damp and cold. It’s been a year of challenges and quite frankly I am glad to see 2011 end. I like the prospect of saying good bye to unsolved family dilemmas and saying hello to awesome new opportunities or the potential thereof! 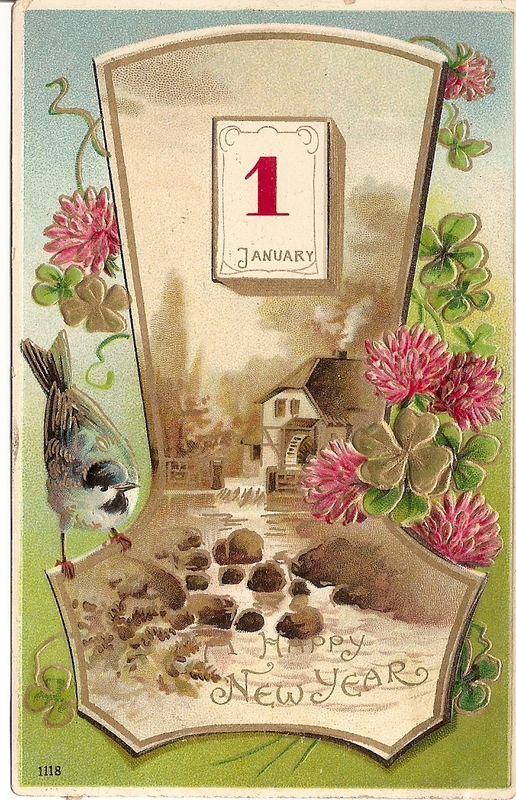 Once upon a time, I would have wished friends and neighbors a New Year of warm, solid, predictability and good luck in all their endeavors – and eagerly sent my grandfather’s chickadee to bear that message. 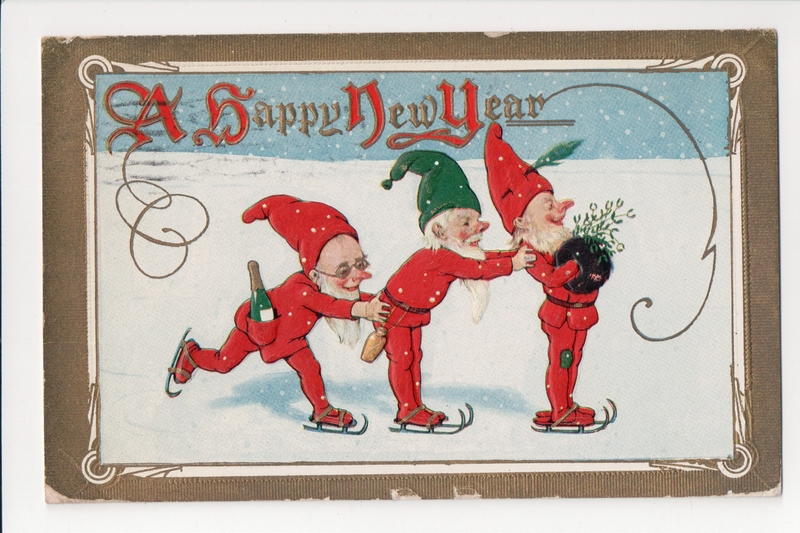 But this year, I yearn for opportunities of innocent jollification and so send these gleeful elves to wish you a New Year full of laughter and affection! Happy New Year!